If you’re looking for a healthy snack that is satisfying, scrumptious and feels like an absolute splurge, then look no further then this weight loss smoothie! It’s got 7 grams of protein to fight hunger yet only 90 delicious calories! 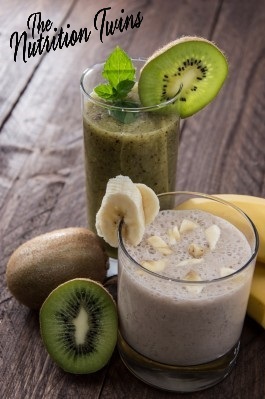 Place kiwi, banana, almond milk, and yogurt in a blender. Blend until smooth or desired thickness. What’s your favorite banana recipe!? The Nutrition Twins’ Veggie Cure! In Search of a Weight Loss Magic Bullet…Could Raspberry Ketones Be The Answer?